DALLAS -- Despite leading by as much as 15 points in the second half, the Trail Blazers were outscored 24-9 in the fourth quarter to lose 102-101 to the Mavericks in front of a sellout crowd of 20,340 Sunday afternoon at American Airlines Center in Dallas. The Trail Blazers are now 33-22 overall and 10-14 on the road this season. Sunday’s loss is the first time this season the Trail Blazers have lost a game after leading going into the fourth quarter. The Mavericks now lead the season series 2-1 with one game left to play. While being outscored by 15 points in the fourth quarter certainly qualifies as unique, Portland had a difficult time holding leads throughout the entirety of Sunday afternoon’s contest in Dallas. First, it was letting the Mavericks back into the game after going on a 21-1 run from the waning moments of the first quarter to the 7:33 mark of the second quarter. That run turned a 25-19 Trail Blazers' deficit into a 39-26 lead, though Dallas would answer with an 11-2 run to cut the advantage to three. 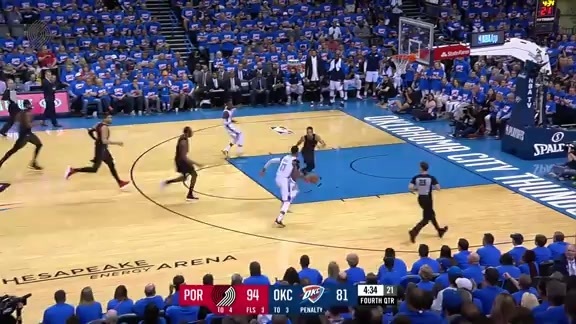 But behind a second-quarter, post-focused scoring outburst by Jusuf Nurkic, Portland pushed back with a 10-2 run to push the lead back to double digits. With Nurkic and the and the bench unit coming up big in, the Trail Blazers eventually went into the half leading 57-47. But after relinquishing much of that halftime lead, the Trail Blazers needed a 21-point, third-quarter “Dame Time” performance from Damian Lillard to push their lead to 92-78 going into the fourth quarter. At that point, it seemed as though the Trail Blazers had enough of a cushion to come away with victory against a Mavericks team that saw much of their roster traded away earlier in the week. 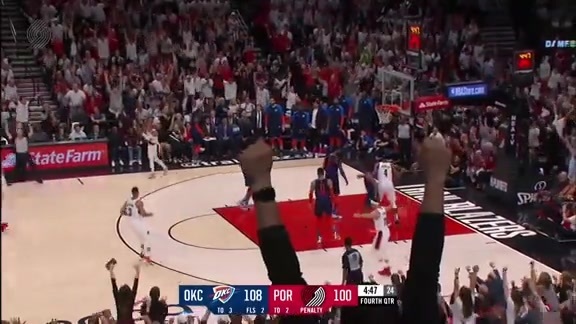 But no lead is large enough when you are seemingly unable to score for almost the entirety of the fourth quarter, as was the case for the Trail Blazers Sunday in Dallas. After Rodney Hood made an eight-footer with 10:43 to play, giving the Trail Blazers a 96-81 lead, Portland went scoreless for the next seven minutes and went without a field goal for over 10 minutes on the way to scoring just nine points in the fourth quarter. Despite their near complete offensive ineptitude in the fourth, Portland still had a chance to come away with the win. But Lillard’s drive to the rim in the final moments of the game came up empty, and thus, sealed the one-point loss. 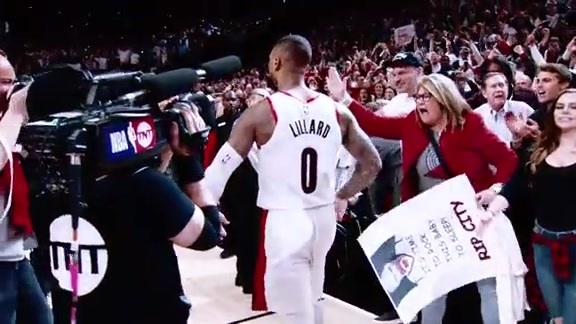 Lillard led all players with 30 points on 10-of-23 shooting from the field and 6-of-11 shooting from three to go with five assists and three rebounds in 36 minutes. Jusuf Nurkic went 9-of-11 from the field for 18 points to go with 10 rebounds before fouling out in 21 minutes. CJ McCollum went 6-of-17 from the field for 14 points, five assists and five rebounds in 33 minutes. Zach Collins added seven points, nine rebounds, two blocks, two steals and an assist in 18 minutes off the bench. Rookie Luka Doncic scored 13 of his 28 points in the fourth quarter to lead the comeback. Tim Hardaway Jr., acquired via trade earlier in the week from the Knicks, shot 50 percent from the field to finish with 24 points. Dwight Powell came off the bench to added 13 points and eight rebounds in just under 27 minutes. Next up, the Trail Blazers take a quick hop to Oklahoma City to face the Thunder in the second game of a back-to-back. "We had a double digit lead. It’s a game we should be able to win and we lost this one," said Lillard. "Tomorrow we’ve got to play against OKC, and we are going to be up against maybe tougher matchups. If we let one like this get away, that should send a message to us." Tipoff is scheduled for 5 p.m.